Hydrostatic pressure can easily drive ground water into the basement through gaps and cracks in the masonry. High water pressure also causes seepage through sold concrete. 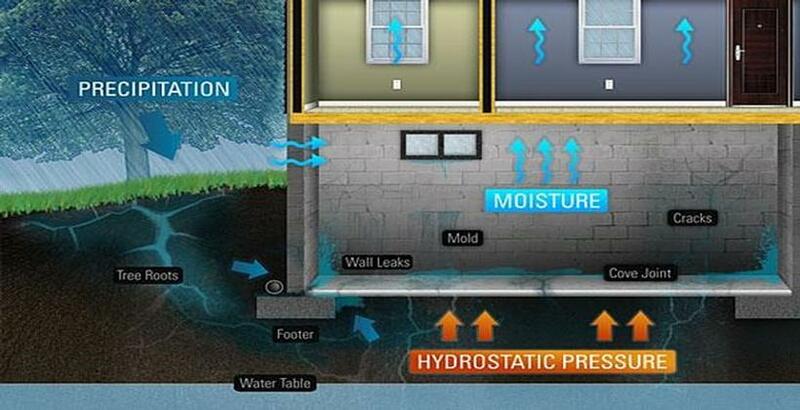 “Hydrostatic Pressure” means water pressure, and it’s a major cause of basement water problems. In Canada, we also get the pressure from the ground freezing and thawing. In Nova Scotia, this is particularily common with the climate by the ocean. The spring thaw not only has normal rain falling in the spring months, but the thawing of the ice and snow puts a lot of pressure on the foundation. Pressure can come from all sides and even under the foundation. This is why it’s important to address basement leaks and cracked walls right away because it will cause more damage and cause the repair cost to go up even more.